Souvenir Fashion is a manufacturer of women's clothing. Women's clothing with high quality and style. Ladies wear something for every taste. like skirts, denim skirts, dresses, costumes, pants and outerwear. Women's clothing is made of high quality fabrics. Our products have their own design that is unique and in line with fashion trends for women's clothing. Variety of ladies poly - wool skirts, denim skirts and modern leather skirts. Suitable for all ages and styles. We also offer leather dresses, modern office suits and everything you need for a wardrobe. More than 20 years on the market in Bulgaria we offer our customers exceptional quality of women's clothing, workmanship and the fabrics our ladies wear make up. 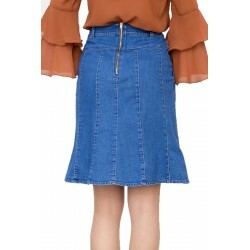 With a variety of denim skirts, leather skirts, woolen skirts, women's pants, women's wear, office suits, jackets, coats and women's jackets, ladies wear, we can meet the demands of even the most demanding women of taste in women's clothing. All ladies fashion house souvenir fashion wear made in Bulgaria. But are sold worldwide, are valued by our customers in Germany, England, Russia and the United States. Fashion House Fashion Souvenir also makes dresses, skirts, pants, jackets, elegant suits size provided by the customers. So you can get your ladies just to your size and your desires. We also offer uniforms for hotels, restaurants, etc. Every day you will find women's clothing in promotions and women's clothing for sale. For wholesalers we can also offer high quality women's clothing. We offer a fast delivery of our ordered women's clothing at competitive prices.